I wish that the internet would turn into a more grown-up version of its current self. As many of you may have noticed I have taken a little time away from blogging. The last year blogging has lost some of the charm it had when I first started (which was a while ago now). My kids were younger when I started, my youngest still took naps, and my oldest hadn't yet started school. I also feel that the internet has changed dramatically. While I love to talk about certain aspects of my life, I am a little burnt out of the over sharing and general debate nature that the internet and social media in particular have taken on. I really hate controversy. When possible I avoid it because 99 percent of the time I have vastly different opinions than everyone else. I grew up in Seattle in a very liberal household, went to a beyond liberal arts school (the same school k-12 with only 300 students), paid my own way through undergraduate and graduate school, and became the first person in my family to graduate college. I grew up very poor, we stood in line at the church food bank most weeks and my father worked his whole life in jobs that barely paid enough to survive. My opinions are a little crazy according to my husband, I rarely agree with any political party and would be perfectly happy avoiding contact with people with overzealous opinions (debating other people rarely leads to any kind of change of opinions). So the internet and I have had to have less contact. I honestly find social media and the internet a little tiring these days. I wish that people could learn the fine act of knowing when to keep their opinions to themselves, not everything has to be made into an argument or debate. Sometimes a simple 'Have a nice day' is just that and nothing more. I guess I am waiting for the internet to grow up, I'm too old to deal with all the drama. My garden has been growing like crazy and I am swimming in fresh herbs. While I love basil, I get tried of making pesto over and over again so I decided to try a dessert recipe using the abundance of fresh garden basil I currently possess. 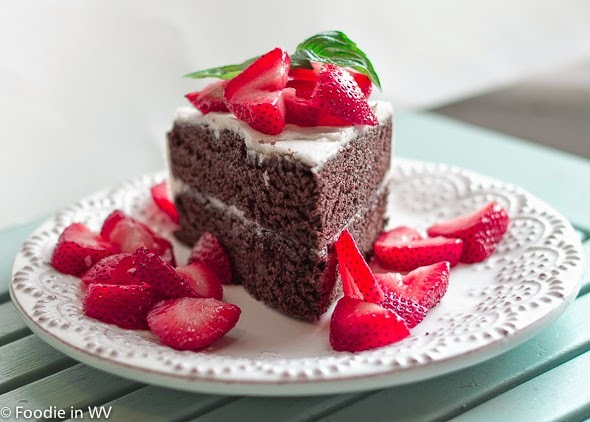 I came up with the following recipe for Chocolate Basil Cake with Buttercream Frosting. Enjoy! In a food processor chop the basil and sugar until finely chopped. Combine the basil/sugar mixture, melted butter, and cocoa powder until blended. Add the eggs one at a time, and whisk until smooth. In another bowl whisk the baking soda, salt and flour until blended. Add hot water and stir just until combined (do not over stir or your cake will be flat). Pour batter into pan and bake for 20-25 minutes. After the cake has cooled make frosting. In a standing mixer whisk butter and sugar together on low speed until blended. Turn up speed to medium and mix another 3 minutes. Add cream and vanilla, beat for another 1-2 minutes on medium. Add more cream if consistency is too thick to spread. Spread cake with frosting and enjoy! My boys both start school in a week and a half so for the first time in 9 years I will have the house to myself for at least a couple of hours a day. I should have more frequent posts in the next couple of months I promise. What lovely and beautiful cake Ann, really I love this ! I have never had luck with growing basil..they either ain't bushy or end up dying..just like the one in my balcony..well, I guess we just don't get enough sun over here. I usually just share the recipes online, and keep personal life just private..social media sometimes can be too much. But I am glad that you are back with this beautiful sweet treat. I love the combination of basil and chocolate...must have tasted awesome. Basil can be hard if the weather isn't warm enough. Our summers are always really hot :) The basil and chocolate together are delicious! I am thanks :) It's nice having a break sometimes! I wouldn't hold your breath waiting for the internet to grow up. I actually think it's getting worse as time goes on. I think the internet will surely only get worse. I've been very happy to avoid social media for almost a year now. Blogs are about it for me these days. 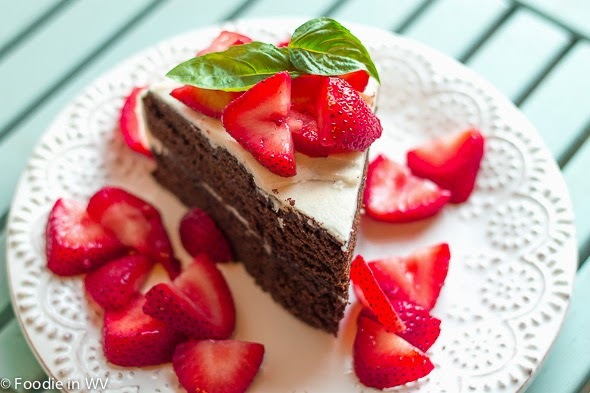 I think this cake sounds really good, I love basil in just about any kind of recipe. I think it will too. Good for you for avoiding social media, I need to start doing that more :) I'm a huge basil fan also, I love it! Yum. Buttercream frosting makes every cake taste better! I'll agree that social media is a lot of drama, but I'm still on it. Wow, it really looks so beautiful. And I'm sure it tastes fantastic too! Thank you for linking at the In and Out of the Kitchen Link Party. Hope to see you again next week.